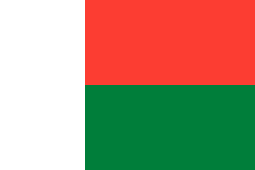 The colors of the flag represent Madagascar's history and traditional peasant classes. Red and white were the colors of the Merina kingdom, which succumbed to France in 1896. They were used in the flag of the last Merina monarch, Queen Ranavalona III. They may indicate the ethnic origins of the Malagasy people in Southeast Asia, and are shared by the flag of Indonesia. Green was the color of the Hova, the largest class of peasant commoners, who played a significant role in anti-French agitation and the independence movement. ^ Merina local flag (Madagascar). Flags of the World (2015-05-20). Retrieved on 2017-10-17. This page was last edited on 8 February 2019, at 17:14 (UTC).